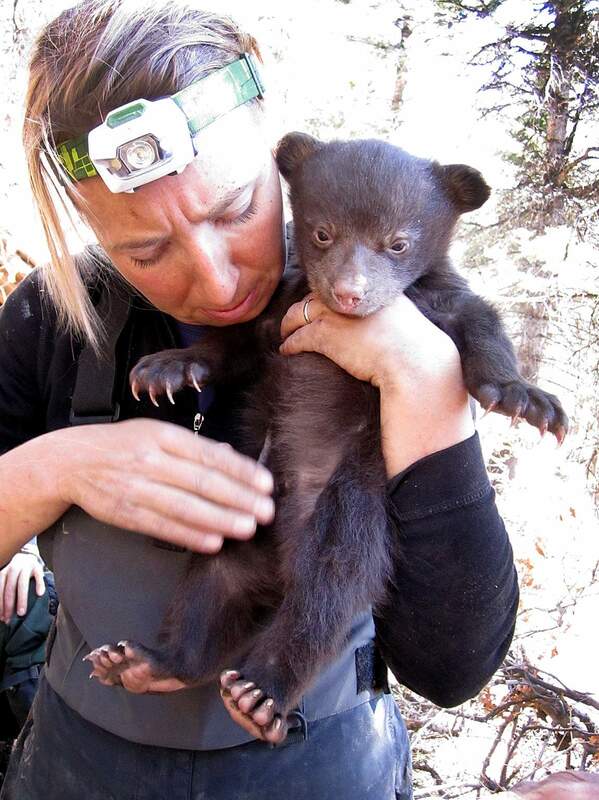 Heather Johnson, a Colorado Parks and Wildlife biologist leading a study of black bears around Durango, tags a cub of a collared female bear at her den. 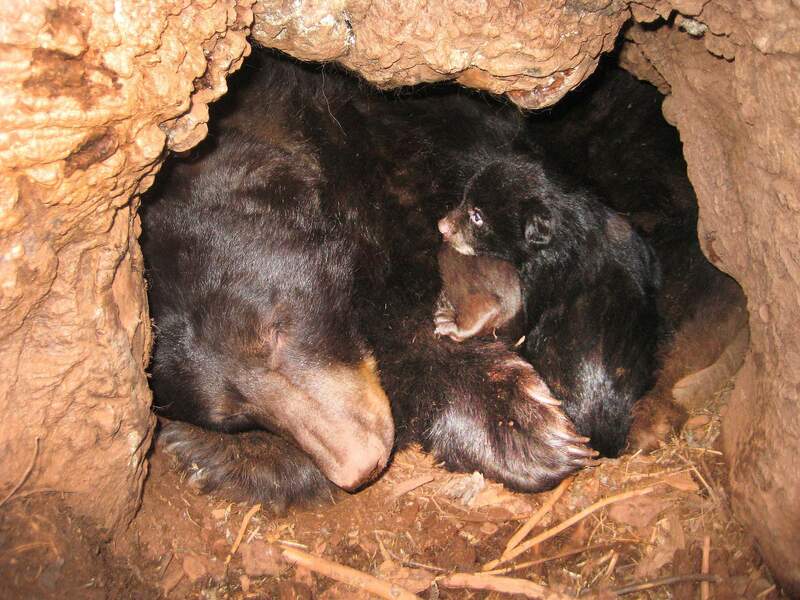 Researchers in March check on a collared female black bear that is immobilized and her cub in the den. Bear No. B25 fed on acorns and berries last summer in the wilderness outside Durango. But about mid-August this year, the female black bear lumbered into downtown Durango, where she remains today, said Heather Johnson, a Colorado Parks and Wildlife biologist who is leading a multiyear study of bears in La Plata County to establish their numbers and learn their habits. Evidence suggests garbage-eating bears have higher reproduction rates than wildland bears, but urban-interface bears also appear to have higher mortality rates, Johnson said. “We're getting to see what factors really drive these switches in behavior and how these different habitat-use patterns are associated with different rates of survival or reproduction,” she said. Johnson gave a presentation Thursday before the Parks and Wildlife Commission, which held its monthly meeting at the Strater Hotel in Durango. The five-year research project is being conducted within a 6-mile radius of Durango. Researchers are 1½ years into the study, which seeks to improve our understanding of how bear populations use urban areas, determine how to reduce bear-human conflicts and improve techniques for estimating bear numbers and population trends. Durango was selected for the study because of its high-quality bear habitat that resides directly adjacent to urban development, according to Parks and Wildlife. It is the first study of its kind in Southwest Colorado, and it will be one of the most comprehensive studies to date about bear-human conflicts. The results should be relevant to other areas in Colorado that experience high bear-human conflicts. As part of the study, Parks and Wildlife officials have captured 316 bears, of which 179 were unique. Every new bear receives an ear tag. The agency has fitted a total of 51 adult females with GPS collars to track their movements. The collars, which cost $4,000 each, transmit a location every hour, which has resulted in more than 100,000 data points during the study. “Females tell us the most about population performance. That's why we've focused on them,” Johnson said. GPS tracking has revealed female black bears to be a diverse species. One bear hasn't ventured beyond a three-block area of Main Avenue, Johnson said. Another set out on a 200-mile loop from Edgemont Ranch to Pagosa Springs to Chama, N.M., to Navajo Reservoir and back to Edgemont Ranch. In addition to capturing bears and tracking them by GPS, researchers have set up hair-snare stations to collect samples from bears that will be genetically analyzed to estimate population size. Researchers already have collected 1,356 hair samples, Johnson said. Next spring, before the bears wake up from their winter hibernation, Parks and Wildlife, working with the city of Durango, will distribute about 900 bear-proof trash cans to residents in two different “treatment zones.” The agency will compare the number of bear-human conflicts in the those zones with the number of conflicts in neighborhoods that don't have bear-proof trash cans, Johnson said. Public-education efforts have not been successful at changing human behavior when it comes to minimizing conflict, such as bears knocking over trash or damaging property, Johnson said. So part of the study includes a three-phase survey to better understand what motivates people to change their behavior, she said. The research project was championed by Rep. J. Paul Brown, R-Ignacio, who encouraged Parks and Wildlife to study bears to better understand their habits and help reduce conflicts, said Rick Cables, director of Parks and Wildlife.